The P-750 started life in 1999 when skydiving groups expressed interest in a modified version of the company’s popular Cresco crop dusting and firefighting aircraft. Retaining the thick, long (42 ft.) wings with their outer wing dihedral, the PT6A engine, and the three-blade Hartzell reversible prop of the Cresco, combined with a larger fuselage and redesigned empennage, flaps, and ailerons, the P-750 was ready for its first flight in 2001 and was Part 23 certified in 2004. 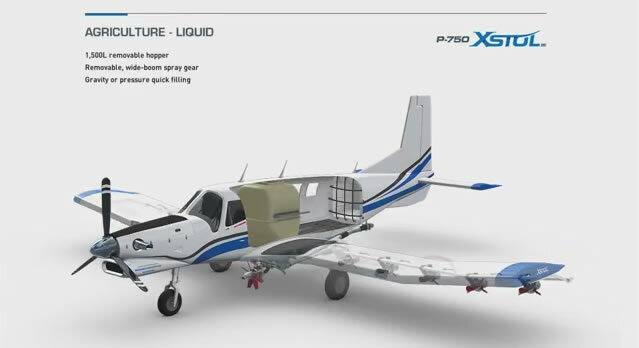 The XSTOL designation is defined as the ability to take-off in under 800 ft with a payload over its empty weight. The P-750 is designed to operate with a 4,000 lb payload from rough terrain, and to perform well from high-altitude, hot weather, semi-prepared airstrips. In its passenger configuration is has 10 seats with a 1,000 lb capacity belly-slung cargo pod and another 18 cubic feet of rear storage. The seats can be removed for an added 240 cubic feet of freight space, or to hold 17 skydivers or six pairs of tandem jumpers. For crop dusting and firebombing operations the plane can be fitted with a 4,888 lb rear-mounted hopper which is filled through a hatch on top of the fuselage. With a low stall speed (58 kts) and good stability it makes a decent aerial survey and photography platform. It has a service ceiling of 20,000 ft. and a max. range of 1,179 nm. P&W PT6A-34 powerplant. At 750 hp it’s a lot of engine for an airplane with an empty weight of only 3,100 lbs. The PT6 class of engines is among the most popular and long-lived ever, having its first flight mounted on a Beechcraft model 18 ‘Twin Beech’ in 1961. Since then PT6 engines have seen service in over 130 different planes, and the company has delivered more than 51,000 of them, with a combined 385 million hours of service. The PT6 is made up of three main components, a gas generator, a turbine, and a gearbox, that have been refined over the years into a modular system that can be mixed and matched to tailor performance for different applications, including a wide range of from 500 shp to 2,000 shp. The company has no plans to retire the venerable PT6 anytime soon, instead focusing on new technologies to make it even better. 2013 marked the 50th anniversary of production of the die-hard engine.